Ulsterman Brian Desmond Hurst directed this rare non-Hitchcock Daphne Du Maurier adaptation for producer Filippo Del Guidice's Twin Cities company, just after the latter had been taken over by J. Arthur Rank. The result, scripted by the novelist with support from future director Terence Young, is a well crafted if overly serious costume melodrama (perhaps trying too hard to avoid comparisons with Gainsborough's bawdier historical romps), which ultimately ends up overreaching itself. The story concerns landowner "Copper John" Brodrick (Cecil Parker), who constructs a mine on top of the titular mound in County Cork in order to dredge up the red metal and make his family's fortune. He succeeds, but not without making enemies of the rival Donovan clan and losing his favourite son in tragic circumstances. Dennis Price plays his misunderstood and unloved second heir, "Greyhound John", who finally wins the hand of local minx Fanny Rosa (Margaret Lockwood), only to father a feckless third generation of Brodricks who proceed to squander the riches of Hungry Hill and die pointlessly. As a production, Hurst's film is hard to fault and notable for a ballroom scene whose opulence is worthy of Ophüls and Visconti. Until, that is, the fiddler gets carried away and the party breaks up into a wild Bacchanalian jig on the manor lawn. However, proceedings ultimately overrun and much is lost when Price departs and is replaced onscreen by his namesake offspring (Dermot Walsh), a selfish, oedipal and sodden soldier who's harder to sympathise with. Lockwood tries to hold it all together with a selection of grey wigs to convey her advancing years but somehow it's just not quite enough. 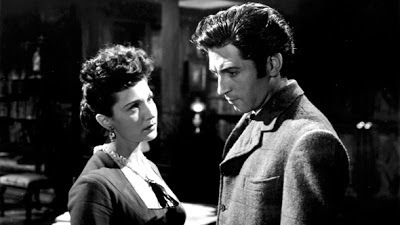 The casting reunites her with Parker following their appearance together in Hitchcock's The Lady Vanishes (1938) and also sees a 19-year old Jean Simmons and young Anthony Wager return from David Lean's Great Expectations (1946). The screening of Hungry Hill I attended at the BFI Southbank was introduced by Allan Esler Smith, the director's great great nephew. The speaker described his relative's early life, growing up in poverty in Belfast at the turn of the century as the seventh child of a shipyard welder, taking his first job in a linen factory, serving in Gallipoli in 1915 and finally relocating to Hollywood to learn his trade as an assistant to John Ford. Hurst went on to direct over 30 movies, including Dangerous Moonlight (1941) and Scrooge (1951), and lived his later years as an affluent swell, rolling around Belgravia in a brand new Bentley. An incredible journey, to be sure. 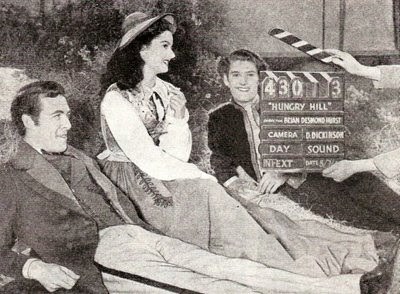 Apparently directors Anthony Asquith, Carol Reed and Michael Powell all arrived on set to wish Hurst success with Hungry Hill on his first day of shooting at Denham Studios in London, a remarkable reminder of the diverse array of talent enlivening the British film scene at that time. 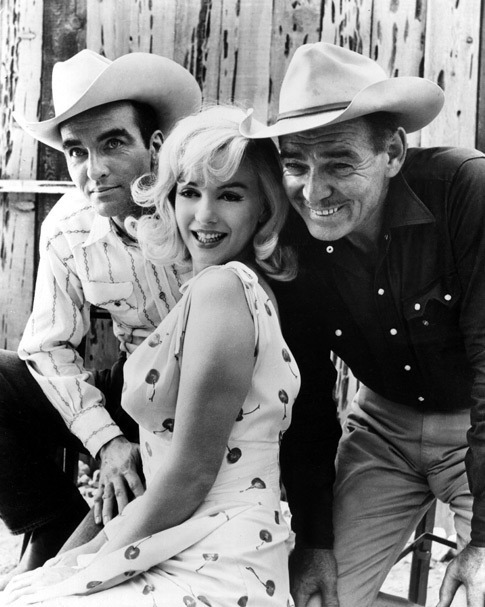 Tom Ewell's washed-up record producer gets more than he bargained for when mobster "Fats" Murdock (Edmond O'Brien) insists he make his girlfriend Jerri Jordan (Jayne Mansfield) a star in Frank Tashlin's cheery rock 'n' roll musical. Punctuated by musical interludes from guests including Gene Vincent, Eddie Cochran, The Platters, Fats Domino and Little Richard - who provides the title song - the film is sumptuously shot in DeLuxe Color and makes for an attractive vehicle for Mansfield even if the plot is ultimately a little thin. The aspiring starlet with an Achilles voice storyline feels borrowed from Singin' In The Rain (1952) while, as a satire of rock 'n' roll's get-rich-quick culture, The Girl Can't Help It ultimately only really amounts to a mild ribbing, even if it does have its merits. Arguably, Tashlin's film is of most interest today as a time capsule, filled as it is with fifties artifacts and attitudes, and for the impact it had on a young John Lennon, who saw it in a flea pit cinema in Liverpool as an impressionable teenager. Ewell fumbles charmingly after his co-star just as he had over Marilyn Monroe in Billy Wilder's The Seven Year Itch 12 months earlier, O'Brien climbs the walls and chews the curtains and Mansfield is as sporting as ever, sashaying around night clubs in a red dress that would make Jessica Rabbit think twice, suffering all manner of innuendos and leers and rising to it by clutching twin milk bottles to her breasts in what must have seemed outlandishly risqué fashion at the time. Jayne does have some more challenging moments, however, and handles them well. Director John Waters, who had Divine parody Mansfield to hilarious effect in his notorious Pink Flamingos (1972), has even gone so far as to compare the scene in which she wistfully proposes to Ewell's Tom Miller that they spend Thanksgiving together, knowing all along that it cannot be, to a Douglas Sirk melodrama. 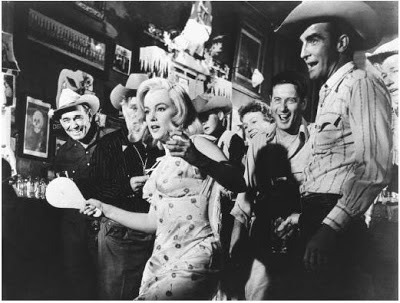 She is certainly touching and obviously much more than a mere Marilyn parody. Former animator Tashlin also shows plenty of flair, notably in the film's very meta opening with Ewell and the scene in which the spectre of Julie London haunts the drunken Miller, her former manager, with a ghostly rendition of 'Cry Me A River', which is genuinely unusual and weirdly reminded me of Scottie Ferguson's troubles in Vertigo (1958). 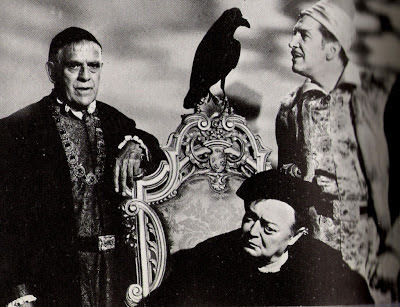 Like The Misfits, this entry in Roger Corman's Edgar Allan Poe series is a rare opportunity to see a number of beloved stars together in one place, with Vincent Price, Boris Karloff, Peter Lorre and even a young Jack Nicholson all gamely taking part. Unfortunately, that place is the same old rickety cliff top castle with a poorly painted backdrop of a stormy sea behind it. This time, Corman's improbable Gothic fortress provides the setting for a face-off between a trio of rival sorcerers in what turns out to be a whimsical comic horror trashing of Poe's deathless narrative poem. 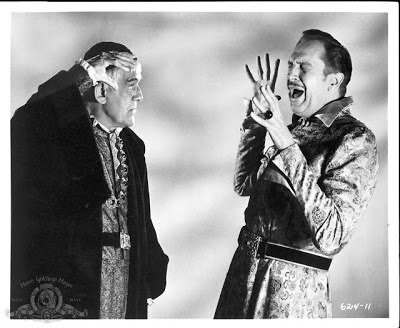 Beginning "once upon a midnight dreary", Corman introduces us to Price's lonely wizard Dr Erasmus Craven (oddly, the rhyme is never commented upon), whom we find, appropriately, moping alone in his chambers, gripped by "sorrow for the lost Lenore". Sure enough, the ill-omened bird comes "gently rapping" but turns out to be an irritable and boozy Lorre, imprisoned in feathered form by the villainous Scarabus (Karloff). Having veered off into reasonably interesting territory closer to the old European folktale 'The Seven Ravens' than to Poe, the script by Richard Matheson then leads us to Scarabus's aforementioned stone manor, the cackling old goat residing within with the supposedly dead Lenore (Hazel Court) on his arm, jealously coveting Craven's powers. A series of not especially funny pre-CGI magical duels then take place, with Lorre seemingly eviscerated into raspberry jam at one point, before evil is overcome and nothing much is learnt by anyone.The Raven is the sort of head-scratchingly purposeless exercise in which having Price bump into an astronomer's telescope counts as comedy and is generally nowhere near as fine as Corman's earlier efforts like The Fall Of The House Of Usher (1960). Quite what the melancholy author would have made of his "rare and radiant maiden whom the angels named Lenore" being reinvented as a grasping strumpet is anyone's guess. Fans of the poem would be better off with the tried-and-tested 'Treehouse Of Horror' episode of The Simpsons or indeed Christopher Walken's spirited recital on the 1997 tribute album Closed On Account Of Rabies. Nevermore! Ambulance driver Frank Jessup (Robert Mitchum) answers a call from the wealthy Tremayne family, arriving at their cliff top mansion in time to help save the life of the lady of the house (Barbara O'Neill), who has narrowly avoided being asphyxiated by a mysterious gas leak. 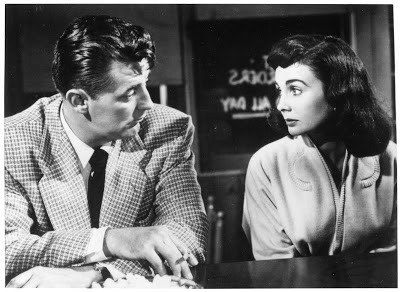 Frank then meets her stepdaughter Diane (Jean Simmons), who appears less than delighted to hear of the matriarch's recovery but quickly takes a shine to him. A sweet slip of a girl devoted to her novelist father (Herbert Marshall), Diane moves quickly to inveigle herself in Frank's life, alienating his girlfriend (Mona Freeman) before promising to give him a job as her chauffeur and help bankroll his fantasy of owning an auto repair shop. However, when Mr and Mrs Tremayne suffer another accident, this time fatal, Frank finds himself accused of murder, with only smooth defence lawyer Fred Barrett (Leon Ames) standing between him and the gallows. Otto Preminger was hauled in to make Angel Face, planned as a James M. Cain knock-off, by RKO's controlling owner Howard Hughes in order to take advantage of the 18 days left on Jean Simmons' contract, the English rose having recently had a violent row with the tycoon that ended with her hacking off her own hair just to spite him (those glossy raven locks belong to a wig). The result is another morose, masterful noir meditation on destructive sexuality from the director of Laura (1944) and Fallen Angel (1945) that remains ludicrously underrated, despite its having impressed Jean-Luc Godard in his Cahiers Du Cinema days. The film is notable for its genuinely shocking conclusion, some pacey court room scenes seven years before Anatomy Of A Murder and the haunting central performance of its starlet, cast against type, whose ghostly complexion practically promises death. Simmons seems to have channelled her fury with Hughes into her portrayal of Diane Tremayne, a pathologically jealous little daddy's girl as manipulative as they come and a serious contender for the ultimate femme fatale. An early draft of Oscar Millard and Frank S. Nugent's script was called The Bystander and, unusually, Mitchum is just that. Playing a variation on his familiar tough loner persona, his Jessup is just another working class stiff, a war veteran with a steady girl and a good head on his shoulders who is nevertheless completely unable to extract himself from Diane's clutches. Both are partners in cruel self-justification, however, so perhaps they deserve their brutal end, which provides another example of mid-century America's queasy fixation with teenage car crashes, three years before the death of James Dean.